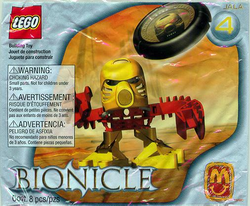 1391 Jala was a small promotional BIONICLE set released in September 2001. It was available with a McDonald's Happy Meal. The set came with eight mainly red and yellow pieces along with a mask, that were used to build the character. The set included a disk which could be flung by putting it into Jala's hand, pulling it back, and releasing. Later on in the BIONICLE series he was released as a Toa Inika and Toa Mahri. Jala's name was later changed to Jaller. Jala was released along with five other similar sets, which are 1388 Huki, 1389 Onepu, 1390 Maku, 1392 Kongu, and 1393 Matoro. He has the same mask as 8534 Tahu, but in yellow. This page was last edited on 9 February 2019, at 16:12.